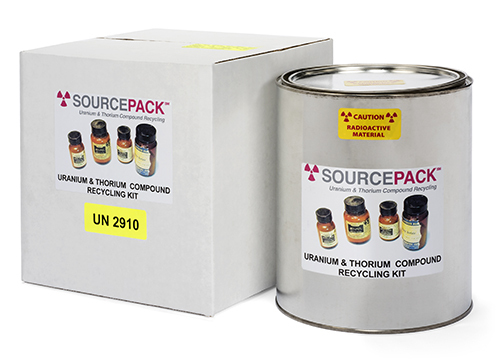 The SourcePackSM recycling kit is designed for shipping uranium and/or thorium chemical compounds that are DOT class 7 (only). Typical compounds include uranyl acetate, uranium/thorium oxide, sulfates, chlorides, and organic or inorganic salts. It's easy to use and comes with detailed packaging and return instructions and DOT function specific training tailored for the shipment of this particular kit. The kit includes the outer fiber box, inner one gallon accumulation container, packaging instructions, DOT markings, DOT function specific training and acknowledgement, prepaid UPS ground shipping both ways and recycling. A Certificate of Transfer and Recycling will be provided after receipt and processing. The SourcePackSM kit is designed to qualify as a DOT strong tight package for shipping as: UN2910 Radioactive materials - excepted package, limited quantity of material, 7. The standard kit is priced for ≤1 pound labeled weight of uranium and thorium chemical compounds. Pricing is for any location in the lower 48 United States. PLEASE NOTE: An inventory and photographs must be sent for approval prior to purchasing this kit. Please click HERE for an information package containing all the instructions and forms you will need to get approval. To ensure you order the correct SourcePackSM kit you must first fill out the Curie inventory form and supply pictures of all chemical compound bottles to Curie Environmental Services for approval. Once your inventory is approved, LifeCycle will contact you to complete your order, and your kit will ship within 2 business days via UPS Ground service. You will be provided with a return material authorization (RMA) number authorizing your shipment to Curie Environmental Services.